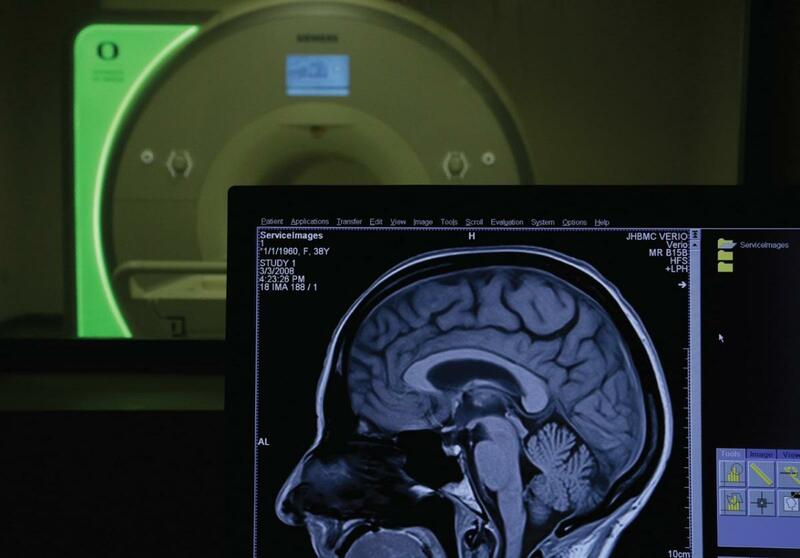 The powerful Siemens Magnetom Skyra 3T MRI scanner at the University of Oregon’s Lewis Center for Neuroimaging (LCNI) is being upgraded to expand the range of imaging options available to researchers. A little more than a year old, this is the second major upgrade to LCNI’s Skyra after the first added multinuclear spectroscopy that allows researchers to detect the magnetic resonance signal of elements that most MRI machines cannot detect. This newest upgrade involves the addition of hardware and software for parallel radio frequency (RF) transmission, which allows shaped RF transmit pulses to improve image quality and enable selective excitation of partial fields of view. One of the first researchers to use this technology was Anita Christie, professor in the UO Department of Human Physiology. Christie is investigating how energy production within muscles changes with advanced age (65-plus years) in individuals who are considered “healthy agers” and those who are showing signs of mobility impairments. Although the UO’s previous MRI machine could perform multinuclear spectroscopy, researchers were limited by the machine’s bore size. The new MRI has a 70-centimeter bore, twice the size of the previous bore, that can comfortably fit a subject’s body, allowing researchers to create detailed images of limbs in action. Without the Skyra, the only way Christie can obtain data for her research is through muscle biopsies, an invasive procedure that only provides a snapshot of information at a given time. In contrast to a biopsy, multinuclear spectroscopy is a non-invasive procedure that can continuously sample data. The LCNI is one of the first sites in the United States to develop its own coils for multinuclear spectroscopy for the latest series of Siemens Skyra MRI machines. Siemens partners with research institutions, like the University of Oregon, to develop new technologies and techniques for MRI research and diagnosis. The innovations in coil design done at the UO could one day be adopted by Siemens to benefit future hospitals, clinics and research institutions.